Upon arrival at Zhangjiajie Hehua International Airport(DYG), you will be transferred to your hotel. After breakfast, set out for your first stop of the day. Take the cable car up to Tianzi Mountain, where you can have a stunning view of the peaks rising one after another. Atop of the mountain offers a full extent of the whole scenic area, which is magnificent and spectacular. There are four wonders in Tianzi Mountain: the Sea of Clouds, the Radiance of the Moonlight, Rays of Sunshine and the Snow in winter. Then take a park shuttle bus to visit Yangjiajie. Known only since 1991, the area is endowed with all the natural wonders found in the other areas but has more unique characteristics. After lunch, hire a local van to Laowuchang (Old House Area). It is an undeveloped part of Zhangjiajie National Forest Park, between Tianzi Mountain and Yuanjiajie. Here you can find Paddies in the Sky Rice Fields. The scenery in the area is incredibly beautiful and overwhelming. Sun rise in Laowuchang is considered by photographers to be the must-shoot scene in Zhangjiajie. Take the park shuttle bus to visit Yuanjiajie. On the summit, you will take about 2.5 hours to walk to view the famous "Hallelujah Mountains", the platform of Forgetfulness, the No. 1 Bridge under Heaven and so on. Later, take Bailong elevator down the mountain and return your hotel. 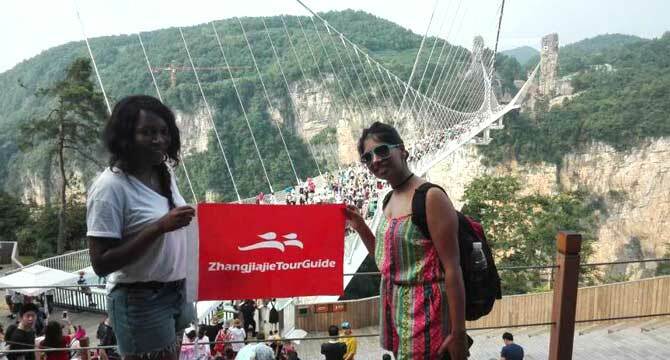 Today explore the attractive Zhangjiajie Grand Canyon, which is known as the landform museum of Zhangjiajie. The highlights of the canyon inlcude A Strip of Sky, Sky Ladder Plank Road, Southern Red Flag Canal, Zhangjiajie Grand Canyon Glass Bridge, Barrel Cliff, Flying Fox Rushing Downhill, Pearl Wall & Waterfall of Butterfly Spring, and Swallow Cliff etc. In the morning, enjoy a wonderful cruise in the beautiful Baofeng Lake. The afternoon is a visit to Tianmen Mountain National Park (also known as Heaven Gate Mountain). You will take the longest cable car in the world to see the stunning 99-hairpin road (Tongtian Avenue) against steep cliffs. Once at the summit take a hike (approximately 2 hours) on the plank road alongside the Guigu Cliff. During the hiking, you can choose to experience the glass skywalk built along a cliff with an extra expense (RMB5/pp). After that, move on to pay a visit to the Tiammen Temple and take the Forest Sightseeing cable car back to the Tianmen Mountain cable car station to take the big cable car up to the middle station. Later, take a bus along the Tongtian Avenue to explore the Tianmen Cave. After sightseeing, transfer to the airport.